Slide 15. Angle measurement from Top Plate Markers. The APAS system utilized a powerful DLT algorithm with a PPT algorithm, which represent linear and non-linear Direct Linear Transformation. Therefore, the APAS system was the top performer for this test. Note as well, that the RMS and the maximum errors recorded were the lowest for the APAS system. 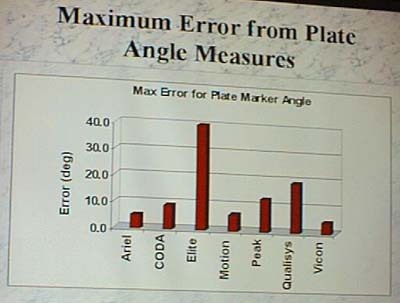 This measurement is probably the most sensitive to errors since 3 markers are involved. Any movement in any of the individual marker will significantly affect the angle. In addition, these 3 markers were obscured from any camera at least 50 percent of the time. This means that the power of the DLT was measured to see how systems can cope with this effect. The 95.8 degrees test measured the angle between the markers on the rotating plate. The known angle between the plate markers was 95.8 degrees. These results are presented in Table 3. [Go to Home Page] [Top] [Back] [Next Page - Results] . The APAS system performed fantastically well when compared to all other companies. When the dollar value of the APAS system is included in the evaluations criteria, clearly the APAS is in a class by itself. (This remarkable APAS system, including hardware and software, is available for only $10,000). Slide 18. 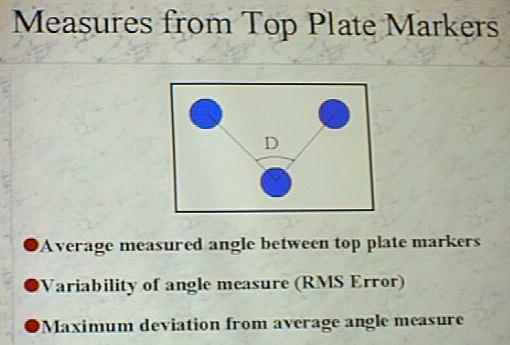 Maximum Error from Plate Angle Measures. Slide 17. 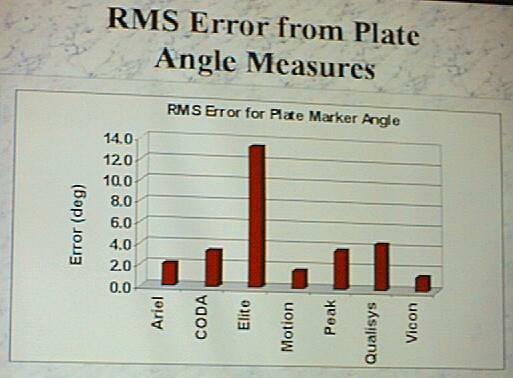 RMS Error from Plate Angle Measures. The APAS system performed remarkably well on this test. This test happened to be very crucial since it had to detect 3 markers on a rotating plate. This situation would never occur in normal human movement but the APAS system was amazingly accurate in determine the angle. Other companies produced as much as 23 degree errors. This measure was particularly useful in demonstrating the superiority of the APAS system over the other systems. Of particular interest, was the poor performances by the Peak, Qualisys, and Vicon systems. Slide 16. Average Measured Angle between Plate Markers. The largest error recorded was the Qualisys with 23.7 degrees and Peak with a 16.4 degree error. If consideration is given to the switching point problem previously mentioned, this error would increase by an order of magnitude and raise questions among researchers as to the appropriateness of these equipment choices for serious research. 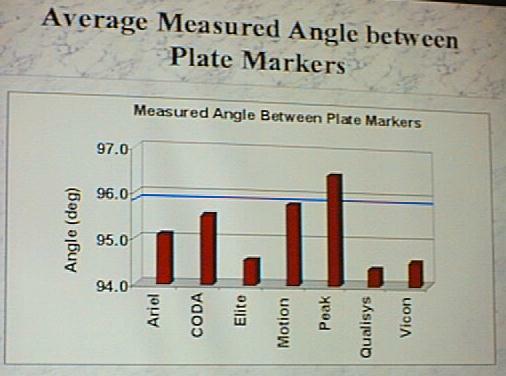 Slide 16 illustrates the average measured angle between the plate markers. The Motion Analysis system measured the average the closest. The APAS recorded the second closest score. However, when measuring the maximum error in estimating the angle, the APAS scored the highest with an RMS error of 1.2 degrees. Although the Motion Analysis system had the best average with 95.1 degrees, the maximum error amounted to more than 7 degrees. The APAS system's calculated average with 95.1 degrees had as it's maximum error only 2.9 degrees. When combining the average error with the RMS error, the APAS system scored the best with 4.1 degrees total error with the next equipment being Vicon with 6 degrees. Table 3. 95.8 Degrees test from the top plate markers. Generated on 4/20/2019 3:29:22 PM (PST) ADI/HQ/GBA/2019/ARIELCLOUD/v3.0.2018.0126.